Do you have a cat lover in your studio? 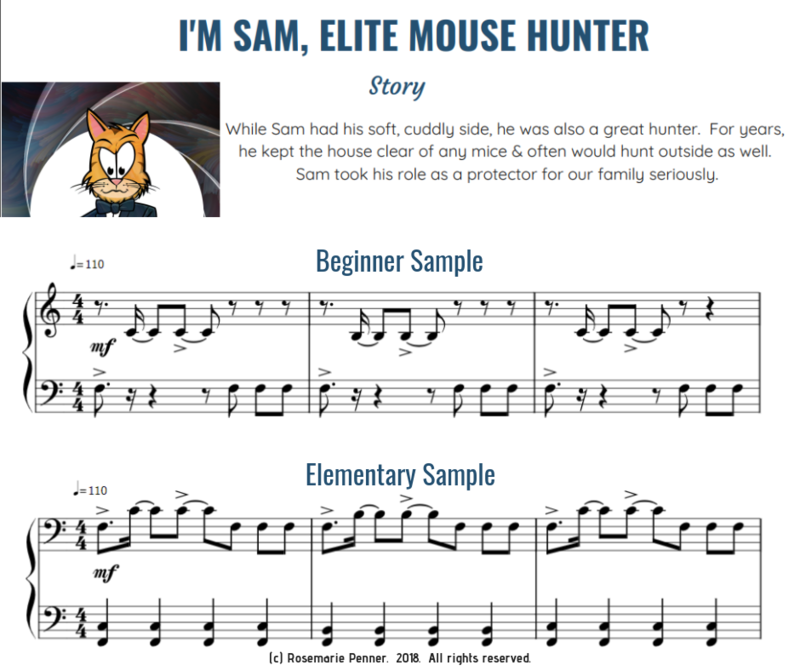 Sam’s Life is a collection of 5 rote pieces for your students that LOVE ‘house’ cats. 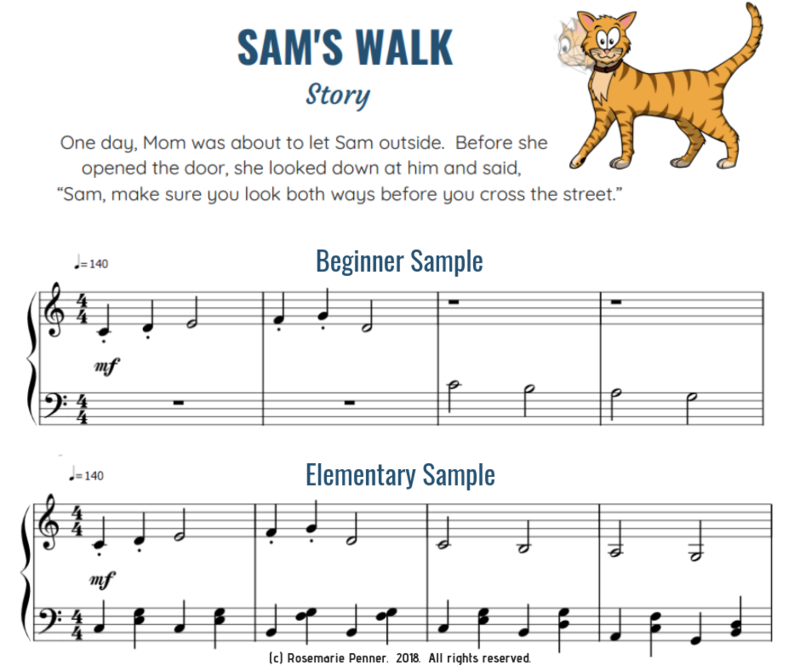 Pieces are in different keys with arrangements that ensure even beginning students have success! With different moods, from upbeat, spy thriller, dreamy & so much more your student are sure to love these pieces. And, adding these rote pieces to your recitals will have students & parents alike clamouring for more! This product is for use with your own students. If you would like to use this in multiple classrooms/studios or with multiple teachers, please contact Rosemarie directly to purchase an additional license. To hear how this book came about, click here. When Sam was just an itty-bitty kitten he had an unusual friend. 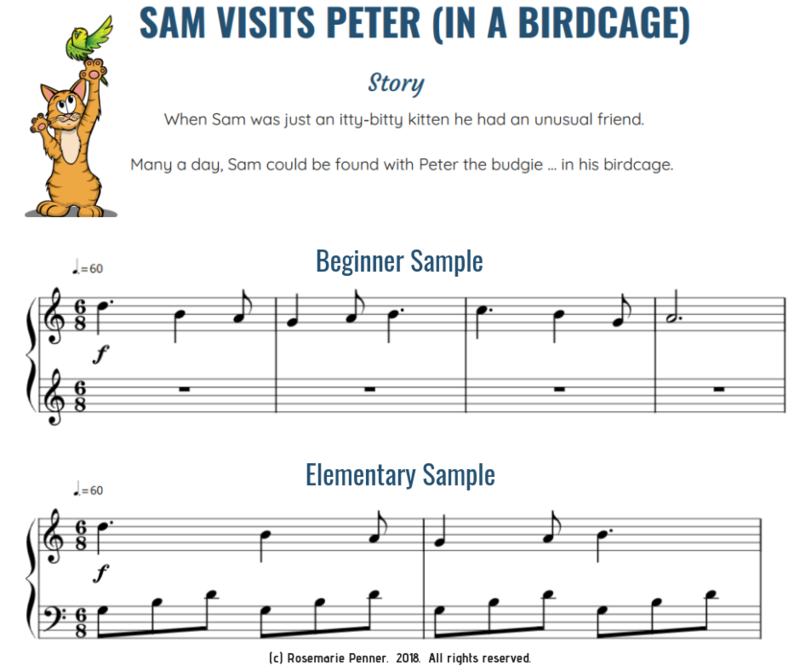 Many a day, Sam could be found with Peter the budgie … in his birdcage. Can you hear them play in this piece about unlikely friendships? Have you ever seen a cat look both ways to cross the street? Find out as you listen to this fun rote piece! While Sam had his soft, cuddly side, he was also a great hunter. Imagine the spies from 60’s movies. They would creep down corridors & leap onto the bad guys. Much like Sam would do as he hunted. Plus, Sam had a cool factor that any of those spies would be envious of. 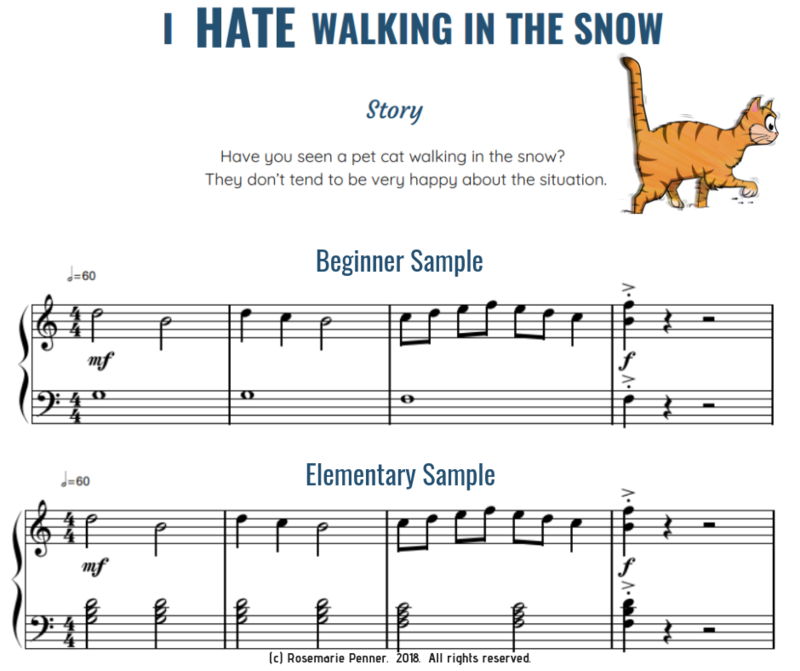 Have you seen a pet cat walking in the snow? They don’t tend to be very happy about the situation. When Sam had to go outside in the snow, he would lift each of his feet high in the air trying to keep dry. His tail would twitch in annoyance. And, the first chance he had to come back inside … he would run quickly past us so we could shut the door. Brrrr! Too cold & wet! Sam had an innate ability to find the warmest, most comfortable patch of sunlight to nap in. What do you think he is dreaming of? 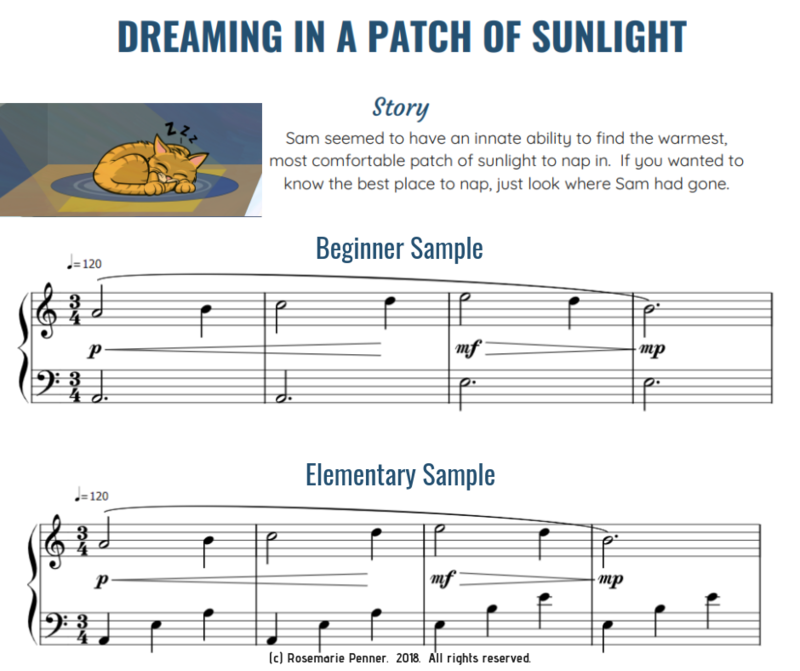 Your students will love this dreamy rote piece that’s perfect for recitals.